clean and comfy beds. perfect for our usage 2 nights on vacation for a wedding. 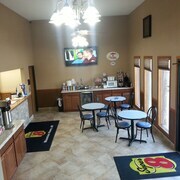 Breakfast area was clean and tidy. 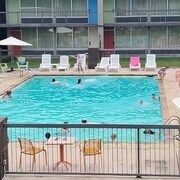 They rent pool for kids parties, loud. Great maid service. Where to find Midway hotels near an airport? Where can I find hotels in Midway that are near tourist attractions? Accommodation options are in short supply within Midway. There are, however, 11 Expedia-listed options within an easy driving distance. 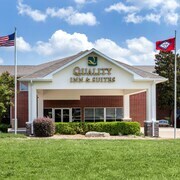 The Holiday Inn Express Hotel & Suites Mountain Home, Arkansas, which is the closest accommodation, is located 11 kilometres (7 miles) from downtown Midway. Another nearby alternative is the Hampton Inn Mountain Home, which is located in Arkansas, which is 11 kilometres (7 miles) from downtown Midway. 11 kilometres (7 miles) from the main part of Midway, is the Comfort Inn Mountain Home. The Days Inn Mountain Home can be found 12 kilometres (8 miles) away. 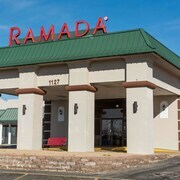 Another possibility is to check out the amenities and rates at the Ramada Mountain Home or the Chandler's Inn. If you have time left, you could explore more of the Northern Arkansas - Ozarks region. Investigate Northern Arkansas - Ozarks' farms. Lovers of the great outdoors should also make the time to enjoy its streams and mountains. Visitors and locals alike in this region of United States of America enjoy mountain biking and rock climbing. If watching sport is what you love, take the time to visit Ballparks of America, which is 75 kilometres (48 miles) to the west of Midway. Sleep nearby to the action at the The Cabins at Green Mountain or the Cabins At Grand Mountain By Thousand Hills Resort. Now that you've checked out hotels and apartments options in Midway, be sure to check out Expedia's Midway travel guide for the inside scoop on the many great attractions here. What are the most popular Midway hotels? 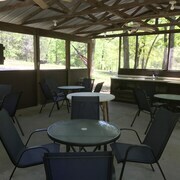 The Hidden Cabin Located Minutes From Shopping and the Lake! New! ON THE Bluff! Amazing Views OF Historical Cotter Overlooking White River! Are there hotels in other cities near Midway? 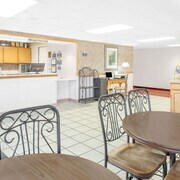 What other types of accommodations are available in Midway? Explore Midway with Expedia.ca’s Travel Guides to find the best flights, cars, holiday packages and more!